The biggest sake festival of its kind in Canada, the Kampai Festival is back this year! The annual celebration showcases over 150 sakes from around the world that will be paired with some of the best in Japanese cuisine in the city. The 2017 festival sees the introduction of an outdoor market, which will focus on Japan’s sake culture. Formerly Front Street Foods, this massive food market has some of the most diverse options in the city. Showcasing the best in Toronto’s restaurants, vendors include Little Fin, Tacos 101, Wahlburgers and Momofuku. 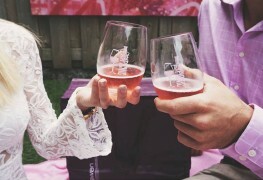 The Appleseed Cider Festival is one of the biggest cider festivals in Ontario. Featuring the best in Ontario Craft Cider, there will be tastings, pairings and cider-related products. Session one is family friendly, while session two is reserved for 19 and older. The inaugural BBQ Eats Festival is promising to be filled with the best barbecue Toronto has to offer. There will be barbecue challenges, tastings and craft brews all weekend long. Participating chefs include Ivana Raca, Sherry Papa, Aleem Syed and more. 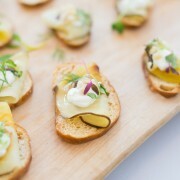 The first Foodalicious is a weekend-long festival filled with food and entertainment. The top food trucks, including Mustache Burger, Crazy Burrito, and Buster's Sea Cove, will be there. There are carnival games, midway rides, live music, giveaways and more. The eighth annual Griffin Session Toronto kicks off Ontario Craft Beer Week with a day filled with craft beer, food and live music! Participating breweries include Big Rock, Muskoka Brewery, Sawdusk Brewing Co. and more. Liberty Commons and Heirloom will provide the food. The Taco Fest is back this year, and it’s bigger than ever. 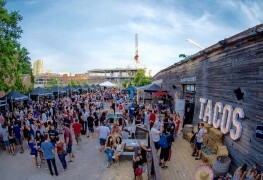 They promise an eclectic mix of Toronto’s chefs offering their take on tacos, guacamole, churros, tequila and more! Plus, the daring can try their luck at riding the bucking taco – think mechanical bull, but instead of a bull, it’s a taco. For nine years the Beach BBQ & Brews Festival has been the number one Father’s Day destination. The festival showcases the best barbecue in Canada, a new craft beer market, wine and spirits area, life-sized board games and a Kids Zone. 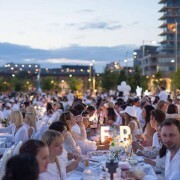 Returning to Sugar Beach this year, the Wine & Spirits Festival celebrates the best in wine and spirits in Toronto. Enjoy wine, spirits, beer, cider, cocktail and more. A portion of ticket sales will be donated to The Music Therapy Trust Fund. The Toronto Craft Beer Festival is taking over Ontario Place this year with all the best craft breweries this province has to offer in attendance. 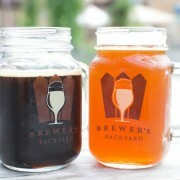 The focus will be on independent craft breweries with samples of award-winning beer and ciders for everyone. There will also be loads of activities and live music. Toronto Life is showing off the top doughnuts in the city with a Doughnut Festival! Doughnuts from Tori’s Bakeshop, Glory Hole, SanRemo, The Rolling Pin, Von Doughnuts and more will be on display for attendees to sample! The Toronto Rib Fest celebrates Canada’s 150th this summer with even more barbecue goodness than previous years! All your favourites will be there from Billy Bones to Texas Rangers to Uncle Sam’s! There’s also loads of activities for the kids! Definitely one of the most anticipated summer food events in Toronto, Summerlicious sees gourmet restaurants offer delicious three-course prix-fixe meals, often at a discount! More than 200 of Toronto’s top restaurant participate, so you’ll want to make your reservations quick! Reservations start June 22. The Island is flooded, but that’s not going to stop the Ladies That Drink Beer from hosting one of the biggest beer festivals in the city! The Summer Craft Beer Fest features some of the best local and international craft breweries alongside some of the best local food! Taste, learn and discover trends, flavours and microbreweries at this one-day festival! From samples to shops to seminars, learn and discover the latest in Halal cuisine. A fast-growing niche on the culinary scene, the Halal Food Festival features the best in the industry, and includes an outdoor street fest! August long weekend is the perfect time to check out Toronto’s food trucks! The cream of the crop will be gathered in Woodbine Park the entire long weekend, and there will be fun activities for the kids and live-eating challenges! 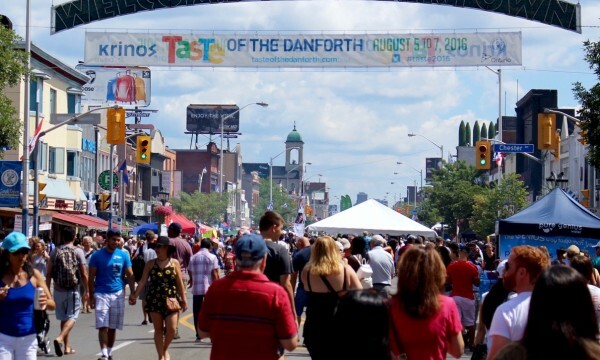 Taste of the Danforth is Toronto’s largest celebration of Greek food! Taking place in the Danforth neighbourhood, restaurants along the famous street open their doors for some of the best Greek cuisine in the city. There will also be live performances and a midway for the kids! Chefs from across the Americas gather at Yonge-Dundas Square for the Pan American Food & Music Festival! Featuring dishes by chefs like Rich Francis, Brock Shepard and Lorena Ramos, there will be lots to eat all weekend long! Celebrity chef Jamie Oliver opened his first international restaurant right here in Toronto, and now he is bringing his famous The Big Feastival to the GTA this year! The weekend is packed with chefs, food vendors, cooking lessons and glamping, promising to be the biggest food festival of the year! The Toronto Vegan Food & Drink Festival showcases the best in vegan cuisine! This year’s vendors include Doomies, Yam Chops, Sweets From Earth, Bunner’s and more. The Toronto Cider Festival is celebrating Canada’s 150 this year with some of the country’s best ciders! This year’s lineup includes Reinhart’s Red Apple, Calvado Boulard, The Great Canadian Cider Company, Ernest Cider and more. Canada’s fourth annual Coconut Festival is back again this year, and includes everything about coconuts, health and fitness! Celebrate the tropical fruit (or nut), in this all-day event, which includes guest speakers, samples and the trendiest coconut products on the market! One of the biggest events of the year Taste of Little Italy is back and promising more food and live entertainment than ever before! Taste some of the best Italian eats in the city as restaurants open their doors all weekend long! There will also be live music and activities for all ages!